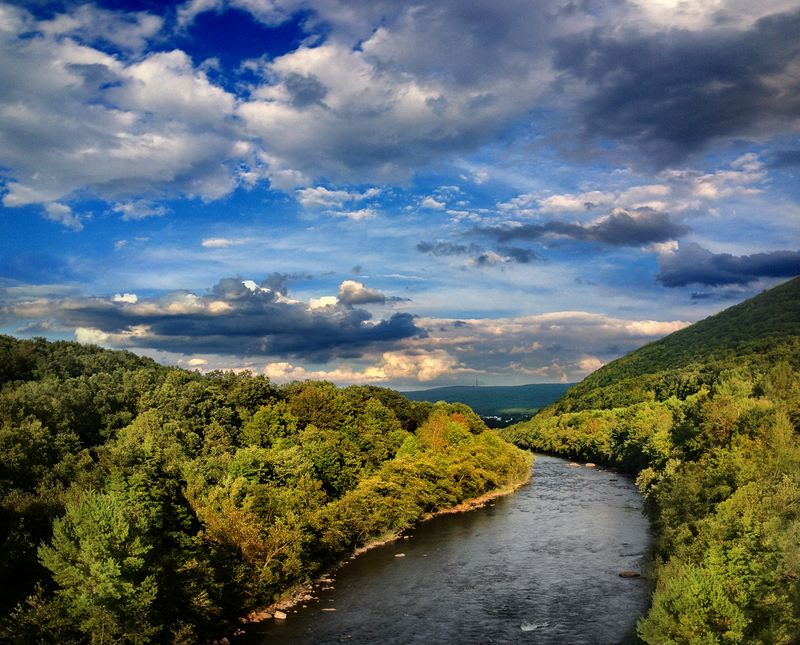 This photograph captures the beauty of Great Gorge, a valley deep in the mountains in Jim Thorpe, PA. This picture was taken from the foot bridge on the walking trail. We had really lucked out that day. It was a beautiful outside and the wind seemed to warm our bones with every new attempt. The town of Jim Thorpe, originally called Mauch Chunk, has a lot of history as well as beautiful sights to see. If you travel down Broadway, you will pass by many historic buildings of the which the architecture has been extremely well preserved. At the bottom of Broadway lies the once very active Central Railroad of New Jersey Station. This station was converted into a beautiful visitors center, and is open most of the week. If you keep traveling up Broadway you will see the spectacular architecture of Addison Hutton, whom built the Lehigh Coal and Navigation Building sitting at the intersection of Broadway and Lehigh Avenue. If you keep climbing up Broadway you will come to one of my personal favorite places to see any musical performances, The Mauch Chunk Opera House. Built in 1881, the Mauch Chunk Opera House is a smaller sized venue, which allows the audience to get up-close and personal with the performer of their choice. When you first walk into this ancient structure you immediately feel that you are being transported into a world that only existed one hundred and fifty years ago. If that's not enough for you there is also the best Whitewater Rafting and Adventure center appropriately named Jim Thorpe River Adventures. I went here a few years ago during a damn release. Looking back I would call it the most fun I had during the summer of 2010. You can travel to Jim Thorpe very easily from the Poconos, by traveling west on Interstate 80 to the Blakeslee 115 exit, then follow that road south until you start to see beautiful landscape. Alternatively one can drive on 209 the whole way as well. Then proceed down all the hills to the bottom most point. Then arrive at one of the most pristine and cutest towns I have seen in Pennsylvania within a reasonable distance from the Pocono mountains. This trail is right down in the park in Jim Thorpe, PA. It is a beautiful old town, with a good deal of interesting history. There are many fantastic hiking trails in Jim Thorpe. Do yourself a favor, when the weather starts getting nicer, head down to Jim Thorpe for the day. Its a beautiful place.